Donald Trump is not a man tied down by convention. So it’s only fitting that he wants to do away with the iconic robin’s egg blue that has been the symbol of the presidency in the sky for decades. According to Axios, during the negotiations with Boeing CEO Dennis Muilenburg earlier this year—when the two agreed on a deal for the cost of refurbishing the two 747 jets purchased from Boeing in 2017—President Trump specified that he’d like to update the paint job of the aircraft to look “more American.” It’s out with what Trump reportedly called a “Jackie Kennedy color” and in with red, white, and blue. The robin’s egg blue—officially called luminous ultramarine blue—was first used when John F Kennedy and Jackie Kennedy approved the design by industrial designer Raymond Loewy. It’s served as the backdrop of iconic comings and goings of 11 US presidents since. Axios reported that some sources in the Air Force are not especially keen on painting over this history. 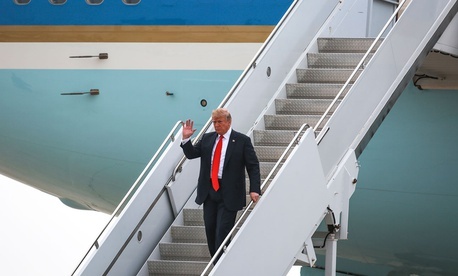 Reports suggest that Trump has been fixated on updating Air Force One for some time now, as he is fed up with the current aging presidential aircraft fleet that went into service under George H.W. Bush. His direct involvement in negotiations with Boeing is seen as unusual, but true to form, the President used the meetings as an opportunity to tout his deal-making skills. There’s just one snag: Trump’s new planes reportedly won't be ready until 2021, so he’ll have to be re-elected before he can take to the skies in red, white, and true blue.